When it’s super cold outside, the only thing I want to do is put on some serious comfy clothes, curl up on the couch and watch a major Bravo TV marathon. This week has definitely been a frigid one so warm loungewear has found its way back into my weekly routine. 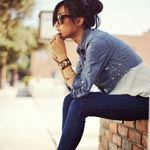 Plus, being in your everyday clothing and all of those layers only makes you (well, at least me) crave comfy clothing even more. Here are 10 great loungewear options to rock out on your couch, and a few to even wear on the town! 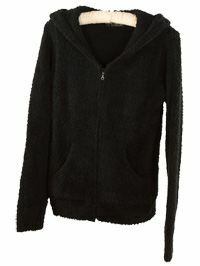 Barefoot Dreams Hoodie CozyChic Midnight, $99. If you’ve ever touched a Barefoot Dreams blanket you know how magically soft these things are, so why not wear one in hoodie form?! Do you see the “word” CozyChic in there?! That’s because this hoodie can’t be anything less. You’ll most likely want to live in this forever and I won’t judge because, well, how can you not?! Wrap up in this warm burst of CozyChic on your laziest of days. Victoria’s Secret Wrap Maxi Skirt, $48. Why not try straying from your usual pants, leggings, and sweats and opt for a chic and comfy skirt? I will admit that I love lounging around or running errands in my favorite casual maxis and they’re just as cozy, if not more so, than some of my favorite lounge pants. 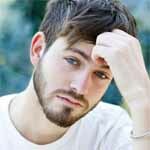 Style this with a comfortable knit, with your favorite boyfriend/slouchy tee, with a thick wool cardi – or however you want. Anthropologie Garden Pot Loungers, $58. How cute are these pants?! Not only do they look incredibly comfortable but they’re right on trend, too. Florals, chevron, print mixing – what’s not to love here? And you won’t have to worry about feeling sloppy when running up to the corner to grab milk in these – throw on some comfy flats and a loose sweater and you definitely won’t look like you just rolled out of bed. Skin Twist and Drape Top, $238. Nothing beats a long sleeved shirt when you’re lounging around the house or running errands and this is definitely a really fab version. Great draping always looks incredibly chic, so this top will definitely amp up your casual wear. And what’s great is that you can even pair this with some skinnys and a pair of ankle booties for a great weekend lunch/dinner look, getting you more out of your lounging wardrobe. 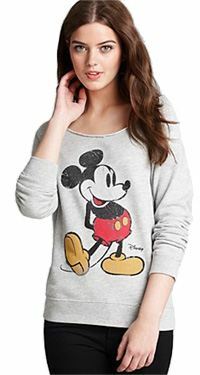 Junk Food Pullover – Mickey Mouse Off Shoulder, $50. Sweat shirts are like the staple loungewear. I love my old college sweatshirts (so much that they have holes in them!) but they’re nowhere near as glam as this Disney-inspired one. I love the slight off the shoulder look, the fit is slim and chic, and anything with Mickey on it is just too cute for words (Carrie Bradshaw had a Mickey t-shirt, ladies!). Wear these with your favorite lounge pants for a great at home, lazy Sunday look. Or why not try throwing under a blazer with a pair of flared denim and some platforms for a great casual weekend look. Ugg Australia Women’s Scuffette II, $80. When talking about winter loungewear you can’t forget one of the more important elements – slippers. Keeping those feet warm are an important part of keeping comfy cozy at home and these Ugg slippers are just the thing to do that. There’s nothing worse than getting off that warm couch and stepping onto cold tile or hardwood so protect those babies with some plush footwear! My boyfriend and brother both own Ugg slippers and live in them, so take cue from these fashionable boys and rock a pair of your own. Free People Ribbed Up Maxi Cardigan, $78. OK, so this isn’t your traditional lounge-y cardigan, but it definitely can make for a great one! Another piece you can wear being lazy around the house or out to grab drinks with the girls. Pair this versatile, lightweight piece with leggings and a tank for home and try pairing with your favorite go-to outfit for the bar. Definitely a great cardi to have in your wardrobe. 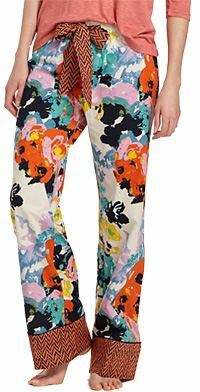 Forever 21 Ikat Print Leggings, $9.80. You’ve heard me mention leggings a couple times in this article, so I think it’s about time I include a pair. Leggings are one of the ultimate musts for a loungewear wardrobe and while we all have the basics and neutrals stocked up, why not include a bold pair for days when you need some extra boost? Bold prints and patterns for me always put me in a more upbeat mood so try a legging a little out of the ordinary. And while you can rock these with your favorite sweatshirts and slouchy tees at home, you can also rock these bad boys out on the town, too. Dorothy Perkins Moustache Printed Socks, $4.00. 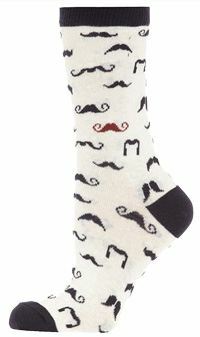 Everyone loves a good mustache, which inevitably means that everyone loves a good mustache printed sock. Rock these fun little guys with your favorite cozy wear or play up a mini dress by pairing these socks with a pair of open-toe heels or booties for a little pop of print. Ralph Lauren Cotton Jersey Pajama Set, $78. Nothing beats a good ol’ fashioned pajama set and nobody does it quite like Ralph Lauren. There’s something so warm and cozy about a pajama set – I’m not sure why that is exactly – but there’s nothing like throwing on a set and curling up in bed with your favorite book. So there you have it – 10 loungewear pieces to help you kick the winter cold. Investing in a couple good pieces will let you have wardrobe staples specifically to help you feel warm and snuggly at home and they’re also great ways to add some comfort to an everyday look. Stay warm and cozy, ladies! Emiko Vaughn is a personal stylist and wardrobe from Cleveland, OH. She currently owns and operates personal styling company Lageson & Vaughn with her business partner, Kirsten Lageson.